Robert Brown Elliott, Reconstruction-era Congressman, was born in 1842 in Liverpool, England. He attended High Holborn Academy in London, England and then studied law, graduating from Eton College in 1859. From there he joined the British Royal Navy. Elliott decided to settle in South Carolina in 1867. He was admitted to the South Carolina bar in 1868 and began practicing law in Columbia, the state capital. Elliott worked under the future Congressman Richard H. Cain as associate editor of the South Carolina Leader and was an elected delegate to the 1868 state constitution convention. Later that year he won a seat in the South Carolina House of Representatives. In 1869, partly because of his military background, Elliott was appointed assistant adjutant-general for South Carolina. He became the first African American commanding general of the South Carolina National Guard which as the state militia was charged with fighting the Ku Klux Klan. In 1870 Elliott was nominated by the Republican Party to run for Congress from the Third Congressional District. Elected in November, 1870, he took his seat in March 1871. While serving in Congress Elliot continuously fought the activities of the Ku Klux Klan (KKK). He also opposed the granting of general amnesty to ranking ex-Confederate military officers and civilians. In 1872 Elliott was a candidate for one of South Carolina’s U.S. Senate seats but lost to fellow Republican John J. Patterson. By 1874, Elliott believed that he could help push his reform agenda further at the state level and resigned his House seat. He quickly won a seat in the South Carolina General Assembly in 1874. In 1875 Elliott was elected Speaker of the General Assembly. In 1876 Elliott was elected South Carolina Attorney General. This would be his last public office. Democrats returned to power in 1876, ending the state’s Reconstruction period. Elliott continued to practice law until 1879 when he accepted an appointment as a special customs inspector for the Treasury Department. One year later, he worked for Secretary of the Treasury John Sherman’s presidential campaign as the manager of Sherman’s black delegates. In 1881 Elliott moved to New Orleans, where he established another law practice. Malaria ended the life of the Robert Brown Elliott on August 9, 1884 in New Orleans, Louisiana, just two days before his forty-second birthday. Bruce A. Ragsdale, Black Americans in Congress, 1870-1989 (Washington: U.S. Government) Maurine Christopher, Black Americans in Congress http://bioguide.congress.gov/ ; Biographical Directory of Robert Elliott Brown. 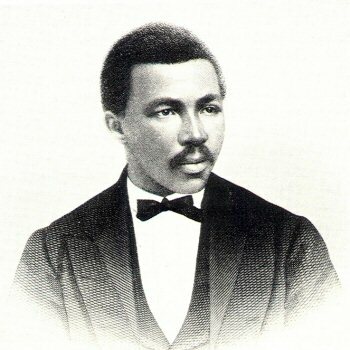 U.S. Government) Maurine Christopher, Black Americans in Congress http://bioguide.congress.gov/ ; Biographical Directory of Robert Elliott Brown.